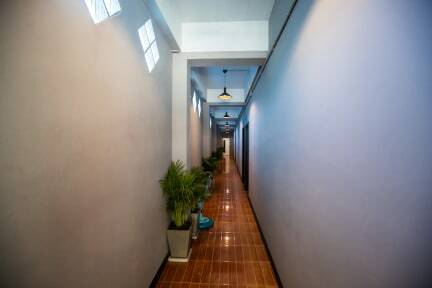 Stayover hostel is the next big thing to visit in Ao Nang. The hostel has a great vibe, staff is so friendly (even gave us a ride to Krabi Town) and you can rend bikes for 200baht a day! I definitely recommend this hostel. Loved our stay at Stayover Hostel! Staff was marvelous, friendly and flexible as we extended our stay twice and could even stay in the same room the first night! Good place to meet people and have a chat. Two balconies on the second floor with a good view and comfortable sitting area. 10min walk to the beach. Beds are the most comfortable of our thailand trip so far! The reception books every tour for you even if its not have it in their system, sometimes even with a little discount. Just ask! Recommended nice hostel and awesome staff. They help out with planning of trips and they also rent out scooters. As a bonus they had free bananas for some energy on your day trips! Would stay here again! Good beds and super friendly staff. They help us out with planning our trips and give good tips, too kind! Facilities are very good and clean. Only little downside is the 10min walk to the market/beach. 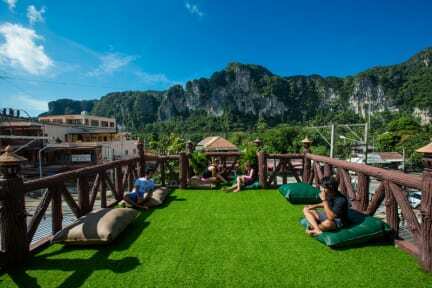 Very good hostel if you wanna relax and enjoy Ao Nang. Nice and clean hostel with very nice staff! Will go out of their way to help you out with problems that may occur. Thanks again guys!! Het hostel is schoon. Verder is het erg rustig. Savonds om 21:00 is er al niemand meer te vinden in het hostel. Deur is altijd open. Bed was zeker goed! Met verduisteringsgordijnen. Personeel is erg vriendelijk en behulpzaam.